From Christian Piatt: When I was a teenager, my youth minister threw a bible at my head for asking questions." Too often, for various reasons, people dont have the opportunity to ask the hard questions they have about faith, religion, salvation and the bible. And when questions are left unanswered in communities of faith, people either seek answers elsewhere or lose interest all together. The purpose of the series is to collect the most compelling and challenging questions from various theological areas and pose them to a panel of experts who are challenged with responding in two hundred words or less in plain English. This volume addresses challenging or controversial questions about scripture collected from people on Facebook, MySpace, Twitter and other social networking media. Respondents include theology professors, clergy, lay leaders, liberals, conservatives and voices representing a spectrum of views. The idea behind the books is not so much to provide definitive answers as it is to stimulate thought, reflection and discussion. By offering multiple perspectives, readers have the opportunity to arrive at their own questions. Better, they come to understand that questioning faith is not taboo, but rather that it can be at the foundation of a strong and growing faith. The directive given to each respondent guided them to be concise and to speak in plan language, but also not to rely exclusively on the Bible says it justifications, or to wax abstract or overly intellectual. Instead, they write from personal experience as much as possible, and provide real-life contexts that will allow the average seeker or churchgoer to apply such ideas to their daily lives. Christian Piatt is an author, editor, speaker, musician and spoken word artist. He serves as the Director of Church Growth and Development at First Christian Church in Portland, OR. Christian is the creator and editor of the Banned Questions book series, which also includes Banned Questions About Christians and Banned Questions About Jesus. He co-created and co-edits the "WTF: Where's the Faith?" young adult series with Chalice Press, and has published a memoir on faith, family and parenting called PregMancy: A Dad, a Little Dude and a Due Date. 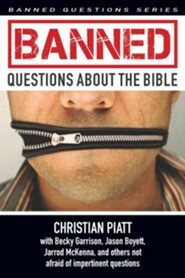 I'm the author/artist and I want to review Banned Questions about the Bible - eBook.